Honolulu, HI (April 3, 2014) – Bring on the Crown Jewel! Stop No. 5 of the Asia-Pacific Tour takes XTERRA to the beautiful island of Saipan in the Northern Marianas – the sports original exotic destination. 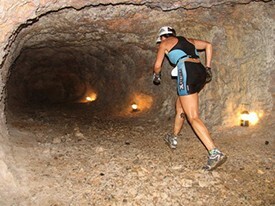 XTERRA first ventured to Saipan in 2002, and 13-years later is still taking racers through caves where Japanese soldiers hid and fought from during the Battle of Saipan in 1944. Some of the sports’ best all-time stories originated in Saipan, from an exploding neighbor island volcano that painted the sky black with ash during the middle of the day to the tsunami threat following the 2011 Tohoku earthquake that played tricks with the ocean currents. Triathlete Magazine called it one of the ‘World’s Best” races in 2011. Richard “Doc” Wall saved a man’s life in the middle of the race one year. New York Times bestselling author Marty Dugard wrote about his adventures at XTERRA Saipan in his book, To Be A Runner. At XTERRA Saipan, the race starts on the same beach where Marines launched their attack in ’44, then the bike course traverses nearly every inch of the island where the battles took place. At the American Memorial Park Museum, many who visit watch a heart-wrenching video on how it all went down, and then walk somberly through the interactive displays. A worthy international elite field is in Saipan to experience that fun along with Saturday’s championship event, highlighted by Dan Hugo and Ben Allen for the men; Renata Bucher and Jacqui Slack for the women. Hugo has been on fire in 2014, winning all three majors he raced at – South Africa (Feb. 23), Philippines (March 15), and Guam (March 29). Allen is fresh off a W at his home country race – the XTERRA Great Ocean Road off-road tri in Australia – and won this race each of the last two years. Other contenders for the men include 4x Saipan Champ Olivier Marceau representing Switzerland, South Africans Bradley Weiss (2nd in Guam) and Nico Sterk (4th in Guam), Kiwis Olly Shaw (3rd in Guam) and Mark Leishman, Markus Benesch from Austria, Michal Bucek from Slovakia, and Charlie Epperson from the U.S. In the women’s race Bucher is shooting for her 8th Saipan title in 10 years but will have to contend with defending champ Jacqui Slack from Great Britain – who just won in Australia last weekend, along with Carina Wasle from Austria and former Saipan resident Mieko Carey. Read what some of the pros had to say in this preview from Roselyn Monroyo of the Saipan Tribune. Note: Saipan is located in the middle of the Western Pacific Ocean – 1,300 miles south of Tokyo, 1,400 miles east of Manila, 3,200 miles west of Honolulu, and 2,900 miles north of Sydney. It offers up azure colored water, a powder blue sky, light island breezes, and tropical 85-degree days prevail year-round providing the perfect venue for XTERRA. The race consists of a 1.5-kilometer ocean swim, a 30km mountain bike that climbs 1,500 feet to the highest point on the island, and an epic 12km trail run that weaves through heavy jungle and into caves used during World War II.